This is my first serious dive into Radiance, I’m running it through Honeybee, and I’m a first-time poster in this forum. Kindly bear with me, I’m doing what I can to relate to the relevant preceding work. I am considering a 1-story tall concave glass facade. I did a forward-ray tracing study in Grasshopper/Rhino to figure out that the most intense periods are at 10AM in February, March, October and November. My goal is to evaluate the worst-case scenario for the intensity of this solar convergence, and ultimately use a heat-balance equation to estimate the resulting tempearture. To check this result, I built up the laminate in the IGDB to retrieve the following angular properties, and BRTDfunc materials from Optics. I saw this discussion so it seems like it should be possible to use BRTDfunc materials to study solar convergence, but I cannot seem to reproduce the effect. If I am only interested in the reflections on one side of the glass, is it necessary to merge the front and back BRTDfunc’s in glazing.cal? The whole process is new, so I’m trying to get oriented. I originally thought this was a problem in Honeybee and posted in Ladybug Discourse, so all my files are posted there, along with more about my process. After failing to get the BRTD functions to work, I changed tactics toward using several mirror materials that are “calibrated” to the angular properties from Optics (above). I broke the curve up into several pieces, and assigned mirror materials according to the angle of incidence with the solar vector. 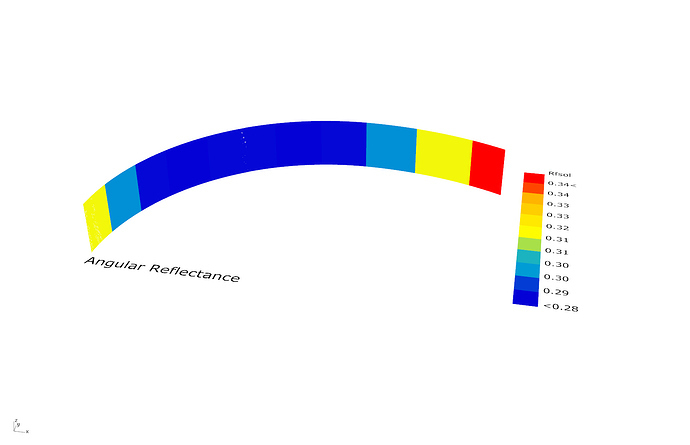 See the image below, which shows the reflectance assigned to different areas of the glass. Is this a reasonable way to move forward? Sarith has pointed me towards this presentation from Lars Oliver Grobe and Roland Schregle and Stephen Wasilewski’s work on Solar Convergence, which leaves me a bit in doubt about whether I need to be using forward ray tracing to assess the intensity of this radiation. Is this a much better approach? Which functions in Radiance should I read up on in order to achieve this in Honeybee? What is the best way to approach this? Is a photon map necessary? ( I’m not sure exactly what this entails, or if it can be done in Honeybee) Am I missing something simple with the BRTDfunc approach? Is the technique of a mirror material and a reduced reflectance appropriate at all? Here is a zip file with the RAD writeout on my attempt with the BRTDfunc material. I cannot interpret it myself yet, but perhaps it provides some insight.